Foxconn, known also as Hon Hai Precision Industry Co., Ltd., is among the biggest manufacturers of electronic equipment in the world. The following infographics presents some vital information about this company. Foxconn is originally a Taiwanese company, but its production bases are spread around the world. It has its facilities in many countries, including China (around 1 mln workers), Brazil, Mexico or Malaysia. Major clients of Foxconn are HP, Nintendo, Microsoft, Google, Apple and Amazon. The largest factory of Foxconn is located in Longhua, Shenzhen, where more than 230 thousand workers live in their own separated city, with every kind of necessary infrastructure. The company is also the biggest private employer in China. Recently, it started to develop its production base in another growing smartphone market: in Brazil. The Taipei-based Taiwanese company, Foxconn, popularly known for being Apple’s iPhone and iPad maker, is considering spending around $12 billion over five to six years towards expanding by setting up production facilities in Brazil. This information, regarding Foxconn’s intentions, was released in a statement made by Dilma Rousseff, Brazil’s President. If this comes through, Foxconn’s expansion move to Brazil would constitute the Taipei-based company’s overseas biggest investment. In addition to Apple, Foxconn currently also manufactures products for other tech giants like HP and Dell. “Make South America’s biggest economy Brazil a global tablet-production hub” is what the Brazilian Government seems to be thinking, given the tax incentives announced by the Government for tablet-manufacturers. Aloizio Mercadante, Brazil’s Science and Technology Minister said in Beijing that Foxconn’s planned facility would go a long way in employment generation, by creating over 100,000 jobs. 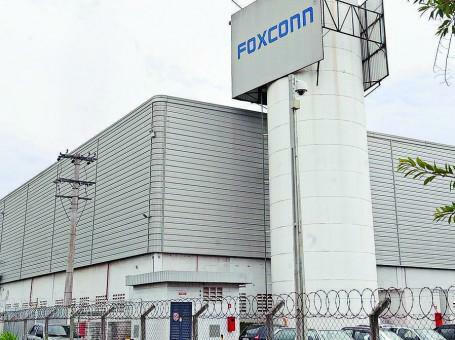 HE further added that to go ahead with the proposed expansion plans, Foxconn would need state infrastructure guarantees such as energy supply, broadband Internet and access to airports. The tax breaks announced by Brazil for tablet manufacturers are also being put to good use by domestic companies. According to reports, MXT, a Brazilian electronics producer based in Betim, Minas Gerais, started manufacturing the first Brazil-based tablet in February and is likely to expand production after the tax incentives take effect. A view of Foxconn’s new iPhone plant. Photo: Alessandro Salvatori, Blog do iPhone. Jundiaí, Brazil – Foxconn’s iPhone and soon-to-be iPad factory about 45 miles north of Sao Paulo is an open secret; despite all the conjecture, it’s exactly where it’s supposed to be and three curious reporters had no problems poking around.On Oct. 31, the Brazilian telecommunications document agency ANATEL issued the OK for Foxconn to start producing mobile phones for Apple. Although the government started talks for a Foxconn plant back in April 2011, this was the first official document wedding Apple’s name with Foxconn in Brazil. Apple and Foxconn are continuing to work on bringing that $12.5 billion iPad plant in Brazil online (there have been no iPads “Made in Brazil” seen yet, unlike iPhones). Meanwhile, the country’s Secretary of Planning and Development of the State of São Paulo Julio Semeghini revealed today that Apple’s favorite contract manufacturer will build up to five factories in Brazil with a thousand employees each. According to a local report by Folha.com, Foxconn of Taiwan (also known as Hon Hai Precision Industry Co.,) will leverage the additional plants to build notebooks and PCs, electronic components, connectors, batteries and precision machine elements. The plants should be located in Jundiai; São Paulo and business negotiations will resume when the Chinese New Year wraps up, according to the secretary. Foxconn already burned an estimated $300 million during the 2010 to 2011 timeframe on the Jundiai, São Paulo plant that is expected to employ 1,400 people assembling iPads. Why is Apple moving manufacturing to Brazil? Tax incentives. News of Foxconn’s expanding operation in Brazil arrives as Apple finds itself lambasted left and right for not bringing overseas jobs to the United States. More worrying than this, however, Foxconn and Apple both found themselves under fire for unfair labor practices and grueling working conditions at the former’s manufacturing facilities in China. But in spite of difficult working conditions, thousands prospective employees recently lined up to apply for the positions at Foxconn’s plants in China. Contrasting this, consumer group SumOfUs said over 35,000 people signed their “Stop Worker Abuse” online petition in just 24 hours. As someone who truly walked the path, Steve Jobs would be pleased to know that his name is being honoured through an avenue that was named after him in the city of Jundiaí, southeast Brazil. The ‘Steve Jobs Avenue’ (Avenida Steve Jobs, in Portuguese) was first formulated and presented as a bill last October, one day after Jobs’ passing, and approved by Jundiaí’s city council on March 27. Previously named after Miguel Moubadda Haddad, a former mayor of Jundiaí, the avenue is one of the routes that connects Jundiaí to São Paulo. It’s also the address of Foxconn in Brazil, the Taiwan-owned company with giant assembly facilities in mainland China that supply much of Apple‘s most popular products. Foxconn already produces iPhones in Jundiaí and they are already planning to soon start making iPads there. Brazil’s first place finish is due to its high tax load and import tariffs. When Apple goods are imported, the importer is charged a transaction tax known as ICMS, then social security taxes of around 9%, plus industrial production taxes, and on top of that, import duties. Then there is the famous logistic bottlenecks of shipping iPads and iPhones from the South and south-eastern ports to the cities a few hours away, at least, by truck. That could change in the future, as the Foxconn subsidiary in Jundiaí is expected to reduce product costs and turn Brazil into a hotspot for exports in Latin America of the Brazilian made Apple devices. According to a report by Brazil’s Tech Guru (Google Translation), over 2,500 Foxconn employees have complained about conditions at the factory. Workers reportedly met last Monday to raise the concerns and have given the company 10 days to address them. Foxconn Technology Group (富士康科技集團) yesterday said it planned to spend 1 billion reais (US$494 million) to build new factories in Brazil that will be tasked with manufacturing Apple’s iPhones and iPads, among other electronic components, making it the group’s latest overseas investment. The announcement came 15 months after group chairman Terry Gou (郭台銘) revealed that Foxconn was in talks with Brazil’s government to build factories to make tablet computers. Gou said the group would collaborate with its clients in search of new growth in emerging markets such as Brazil, Russia and South Africa, which is part of the group’s five-year program to spur growth. With the 1 billion reais investment, Foxconn will open five factories in an industrial park in Itu, a city near Sao Paulo, said Simon Hsing (邢治平), spokesman of Foxconn’s flagship company Hon Hai Precision Industry Co Ltd (鴻海精密). The new facilities are scheduled to crank out their first batch of products in 2014 and are expected to reach full capacity by 2016, Foxconn said, confirming a report by the Agencia Estado news agency on Tuesday. Foxconn said it also planned to manufacture cables, cameras, touch-sensor glass, LED products, printed-circuit boards (PCBs) and other components. The investment will create 10,000 jobs, Gou told shareholders, adding that Foxconn had already hired about 6,000 workers in Brazil. Foxconn now assembles Apple products at a plant in Jundiai and operates four other plants in Sao Paulo and three plants in other states of the Latin American country. Foxconn’s Brazil unit chief executive officer Henry Cheng (鄭家純) is set to sign a memorandum of understanding with Luciano Almeida, president of Investe Sao Paulo, at the Palacio dos Bandeirantes, Hsing said. Investe Sao Paulo is the gateway for foreign companies that intend to settle their operations in the state of Sao Paulo. Hsing said the technology group would not benefit from special tax incentives from the state government of Sao Paulo. Gou said in June last year that he was in discussion with the Brazilian government to help the country build a technology center and build an electronics supply chain. He said 14 Taiwanese companies, including Acer Inc (宏碁) and Asustek Computer Inc (華碩), had agreed to join this program. 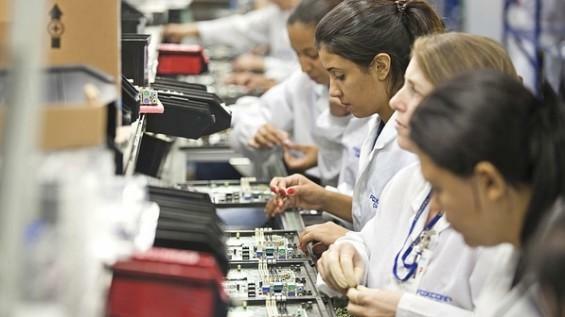 Workers at Foxconn’s second plant in Jundiaí, Brazil have succeeded in attaining the same salary and career opportunities as employees in the company’s other major plant in the city. The victory came in a deal between Foxconn and the Metalworkers Union of Jundiaí following a five-day strike involving 3,700 workers. The implementation of the new salary structure will take a year to be finalized, but from September 2014 workers at plant two will get an equal wage to those working in plant one. 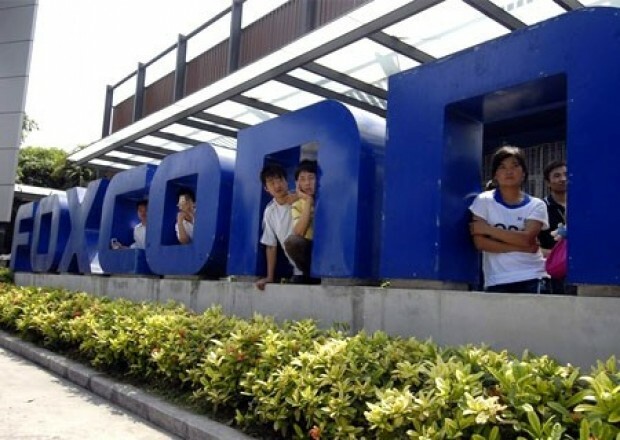 Foxconn, a Taiwanese electronics multinational, has also agreed to give the workers full pay for the period of the strike, which ended on 18 September. Foxconn launched its largest factory in Brazil in Jundiaí in 2007. The site specializes in manufacturing computers, notebooks and motherboards. In 2011, the company opened its second production unit in the same city, which is the only facility outside China to assemble iphones and ipads for Apple. While some believed that Foxconn’s 2011 expansion to Brazil would bring as many as 100,000 jobs and $12 billion in capital investment, the company currently has fewer than 10,000 employees in its 5 Brazilian factories, according to Reuters. One of those facilities is reportedly dedicated to production of Apple’s iPhone 5s.Despite a public commitment to invest at least $325 million in a new industrial park in Itu, outside of São Paulo, the site is not yet operational, though Foxconn did say it should come online by the end of 2015. The lack of headway has been cause for consternation among city officials. Of the jobs that Foxconn has brought, many pay little more than minimum wage. Acceptance testers at the Brazilian iPhone plant, for example, bring home just $80 per week and lack access to the same training and advancement opportunities that their counterparts in Foxconn’s Chinese facilities receive. Workers have held at least three strikes at the iPhone factory, and a union representative said they were planning another. Such labor flare-ups have angered Foxconn founder Terry Guo, who infamously slammed Brazilian labor in 2010. The iPhones now rolling off an assembly line near São Paulo, the only ones in the world made outside China, carry a retail price tag of nearly $1,000 for a 32-gigabyte iPhone 5S without a contract – among the highest prices in the world and about twice what they sell for in the U.S. The firm appears to be giving up on the country following promises of $12bn investment. Foxconn is set to cease its manufacturing activities in Brazil, according to sources close to the Taiwanese company. 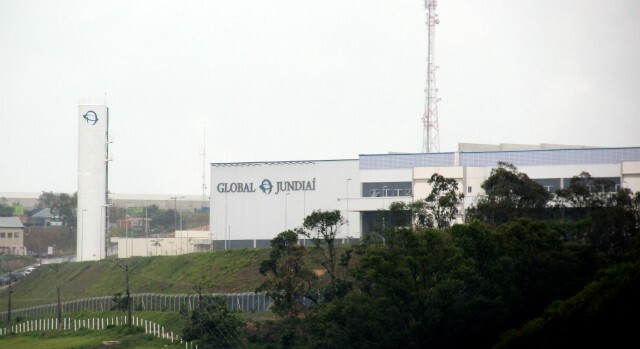 The company’s staff have been working on shutting down the facility located in Jundiaí, a city in the metropolitan region of São Paulo, and assisting on the deactivation and sale of machinery, according to Brazilian business magazine IstoÉDinheiro. Foxconn had a second facility in the same business park, which is already empty. The idea is to only keep a limited local set-up intended for parts replacement and maintenance, according to the article. The news Foxconn is stopping its manufacturing activities in Brazil is a far cry from all the noise the firm caused a few years ago: back in 2011, the company had pledged to invest $12bn in the country and create 100,000 local jobs within six years. Back in 2011, Foxconn promised to create 100,000 jobs in Brazil within six years, also pledging to invest no less than $12 billion in the country. However, the company also required 30 percent of that sum from the Brazilian government, and to bring in a private investor as well. Sadly, both failed to materialize, and now Foxconn is close to shutting down its manufacturing facilities in Brazil for good. According to the local press, the facility located in Jundiai is shutting down, and the machinery is being deactivated and sold. Another Foxconn facility in the area is already empty, and it seems that Foxconn will only keep a small set-up for parts replacement and maintenance. When contacted by ZDNet, Foxconn declined to comment. However, insiders familiar with the matter confirmed that Foxconn is getting ready to shut down all its manufacturing operations in Brazil. On the other hand, they told the local press they have no plans to downsize. The political press ate it up, alternatively excoriating the program for costing too much in tax breaks and crowing a win for Wisconsin’s conservative governor, Scott Walker.I wouldn’t encourage either party to hold their breath. From The Progressive: An illustrated journey into the dark heart of a really bad deal. Otis Redding performs the aptly named song Shama Lama Ding Dong – for the Tools and Fools who govern SE WI. PARTY ON! MTP President David DeGoof! Hey – SE WI! You’ve been Fox-Scammed! A lesson from history, as it seems to repeat. The WPA is reborn via Foxconn, Amazon, and other large scale Corporate interests as governments borrow money to finance private ventures with the hopes of employment for the masses and a future payout so that they can maintain the status quo for grossly overpaid/compensated Bureaucrats, and those fortunate enough to be employed in taxpayer financed public/private ventures and non-profits. Headed by Harry Hopkins, the WPA provided jobs and income to the unemployed during the Great Depression in the United States, while developing infrastructure to support the current and future society. At its peak in 1938, it provided paid jobs for three million unemployed men and women, as well as youth in a separate division, the National Youth Administration. Between 1935 and 1943, when the agency was disbanded, the WPA employed 8.5 million people. Most people who needed a job were eligible for employment in some capacity. Hourly wages were typically set to the prevailing wages in each area.Full employment, which was reached in 1942 and emerged as a long-term national goal around 1944, was not the goal of the WPA; rather, it tried to provide one paid job for all families in which the breadwinner suffered long-term unemployment. BAU (Business As Usual) must continue at all costs – residents, environment, resources, and basic decency will not be allowed to interfere with progress. The battle for the radical change of learning to live with less and create truly Sustainable Communities, recognizing that resources on Planet Earth are finite, has been lost. About 2,000 years ago, the Roman philosopher Lucius Annaeus Seneca wrote to his friend Licilius noting that “growth is slow, but ruin is rapid”. It was an apparently obvious observation, but one of those observations that turns out to be not obvious at all if you just think a little about it. All together, these factors push the world system to follow a well defined path. We cannot determine exactly what the future will be, but we can produce a “fan” of trajectories that show to us where the system is heading to. The original 1972 LTG study had already identified the main factors that have been dominating the behavior of the world’s economy. The combined effects of resource depletion and pollution accumulation (seen today mainly in terms of climate change) have been gradually reducing the ability of the industrial system of accumulating capital and of fuelling growth. These factors will, eventually, cause the world’s industrial and agricultural systems to start a decline that could be defined as “collapse” which, later on, will involve also the collapse of the world’s population. Reality has been transcended by television programming and the smartphone – a phone for dumb people; which is why it is the smartphone. IF Foxconn could readily employ 13,000 at a minimum of $53G each, as the Politicans of WI claim, then why can’t other local private Employers? If being paid $53G – and does that include the non-taxable fringe? – is such a great thing – then why are the halls of local government filled with Bureaucrats making $100G plus a year, Tax -free fringes well in excess of $25G, and early retirements, providing opportunities for a second double dipping career in the non-productive World of Management? The only thing Bureaucrats farm is TAXES! RACINE – A proposal to review vacant high-paying city positions in hopes of finding cost-saving opportunities failed to move past the Finance and Personnel Committee on Monday. Under the proposal, any position vacant due to retirement or resignation that typically pays more than $100,000 in salary and benefits would be reviewed by the committee and City Council before any hire, said Alderman Eric Marcus, who proposed the idea. In some cases, he said, the responsibilities of a currently unfilled position may be divided among other employees or the committee could decide to reduce a position’s salary. “I think it’s an opportunity to see if there is some way we can combine positions in an era of real fiscal responsibility,” Marcus said. There are about 150 city positions that are paid, through salaries and benefits, more than $100,000 a year. Too often, these same Bureaucrats then flee Racine County, even the State of Wisconsin, to establish residence in a State without income tax and lower property tax rates! They become tax-evading Snow-Birds! But still they demand more yearly increases while they avoid paying the taxes which fund their retirements, benefits, and increases! Tax planning is a cornerstone of retirement planning. But by focusing on Uncle Sam, many retirees overlook the state-tax bite. States vary across the map on how they tax everything from retirement income to retail purchases. If you’re thinking of relocating, be sure to know how potential retirement destinations compare with your current state when it comes to taxes. It is assumed that ERoEI >5 to 7 is required for modern society to function. This marks the edge of The Net Energy Cliff and it is clear that new Green technologies designed to save humanity from CO2 may kill humanity through energy starvation instead. Fossil fuels remain comfortably away from the cliff edge but march closer to it for every year that passes. But in the end, Industrial Civilization, predicated upon a civilization dependent upon an infinite supply of cheap petroleum, will spectacularly fail because there are limits to growth on a finite Planet. And an exponential curve works like this…… a doubling every time…… 1 to 2 to 4 to 8 to 16 to 32 to 64 to 128 to 256 to 512 to 1024…. to infinity. Politicians LIE for a living. Politicians have to lie, because it is their only means of support. They justify endless wars, instill fear, demand endless tribute, and bully the productive. Their ranks multiply until they become a unstoppable swarm whose insatiable demands exceed the capacity of the productive, rapes the land, and creates societal collapse. Soon to be coming to SE WI and beyond. ALL OF THIS GROWTH WILL OCCUR ON DEFERRED DEBT, OR NEW DEBT. MOST, IF NOT ALL OF THIS NEW GROWTH WILL GET EXPORTED TO FOREIGN COUNTIES. MORE LTO PRODUCTION = LOWER PRICES (now down 18% in <5 weeks), NO PROFIT… AND WILL FURTHER REDUCE THE SHALE OIL INDUSTRY’S ABILITY TO PAY BACK DEBT OR REFINANCE DEBT AS MATURITIES LOOM. Dazed and Confused Politicians in SE Wisconsin simply don’t understand that Foxconn is in the business of making money, while keeping their labor costs low, so profits are maximized. Politicians never have to worry about labor costs or selling price points because they have the power of taxation – imposing the collection of taxes at the point of a gun, versus the private sector, which must sell consumers a manufactured product. Which in Wisconsin Foxconn’s case is a LCD TV. SE Wisconsin residents need to be particularly concerned as Foxconn has recently decided to discontinue it’s $12 Billion investment in Brazil! While some believed that Foxconn’s 2011 expansion to Brazil would bring as many as 100,000 jobs and $12 billion in capital investment, the company currently has fewer than 10,000 employees in its 5 Brazilian factories, according to Reuters. One of those facilities is reportedly dedicated to production of Apple’s iPhone 5s. Despite a public commitment to invest at least $325 million in a new industrial park in Itu, outside of São Paulo, the site is not yet operational, though Foxconn did say it should come online by the end of 2015. The lack of headway has been cause for consternation among city officials. “Brazilian workers’ wages are very high. But Brazilians, as soon as they hear ‘soccer,’ they stop working. And there’s all the dancing. It’s crazy,” he said at the time. Manufacturing Apple devices in Brazil also has not had the desired effect of lowering local prices, which are inflated by as much as 30 percent on imported goods thanks to various taxes and tariffs. iPhones and iPads routinely sell for twice as much in Brazil as they do in the U.S., which does not surprise local residents. Meanwhile, ZD Net reports that Foxconn, in addition to ceasing it’s manufacturing operations in Brazil, is closing it’s facilities, and selling off the manufacturing equipment. The company did not reply to ZDNet’s requests for comment but local publications have cited a statement from the firm denying the downsizing of its local business. However, market sources have confirmed that the company is indeed preparing to close down its Brazil manufacturing operations. However, the promises soon proved hard to keep: the company wanted the Brazilian government to come up with 30 percent of the cash, as well as a private investor – both failed to materialize. As well as the economic instability that the Brazilian economy, it is also rumored that other factors influencing the decision include the productivity of the local workforce – which at its peak reached about 2,500 workers – which Foxconn considers to be low when compared to its main manufacturing operations. The Foxconn promise of a $10B investment in Wisconsin is nothing but a SCAM – and when it collapses, as it has in so many other Countries and Places, Residents of SE Wisconsin, actually ALL of Wisconsin, will be held accountable to pay the bills, complete with interest and penalties – due. Please join Cindy and I is JUST SAYING NO to allowing Governor Scott Walker, Racine County Executive Jonathan Delagrave, City of Racine Mayor Cory Mason & MTP President David DeGroot to violate the Wisconsin Constitution (and their Oath of Office) by granting special rights to Corporate interests, stealing people’s property, destroying multi-generational Farms alongside an entire long established Community, loosening environmental protections, permitting heavy metals water pollution, instituting slave labor wages, providing taxpayer subsidies to multi-billionaire Corporations, and politician overreach. Mark & Joyce Sonday *WIN* the Land Speculation Lottery as Village of Mount Pleasant Pays Them $400,300 Per Acre! The village has listed a property parcel they purchased in Sturtevant just a few weeks ago, located at HWY 11 and HWY H. The village purchased the property for $784,000 saying they HAD to buy the entire parcel for road widening. At the time, the fair market value of the parcel was $135,000. Sources confirmed to us the high purchase price was most likely because the village had no authority to impose eminent domain in another jurisdiction – so the seller got a great deal. The village will tear down the long vacant house and will only entertain offers above $550,000. While the Village of Mount Pleasant paid $800,600 for two acres, of only which a partial strip was needed, these lands were only assessed for a combined total of $156,000. 2925 105th Street was zoned commercial with a land value of $67,000 and an improved value of $42,400, for a total of $109,400. While 2941 105th Street was zoned Residential with a land value of only $46,600. In addition, Attorney Alan Marcuvitz is also Mount Pleasant’s property acquisition attorney and expert. The below is from screenshot which clearly indicates the level of conflict between Residents and Elected/Appointed Officials as the Village forces Residents off with Eminent Domain, Blight, low-ball offers, threats and intimidation. Interestingly enough, while Mark Sonday initially lost his land to the Pleasant Prairie CDA, he won a major arbitration award in 2006. Cheated Mount Pleasant residents need to pay attention! In 2002, Pleasant Prairie used eminent domain to condemn hundreds of acres, including the museum site and Mark Sonday’s van-conversion business, to make way for development along I-94. Village officials said the museum doubled as a military scrap yard and didn’t fit in with the corporate image they wanted their municipality to project. In 2006, an arbitrator awarded Mark Sonday a $3.9 million settlement, ending the condemnation process and giving the family enough cash to move the museum and pay $160,000 in legal fees. Does Mark Sonday and MTP Attorney Alan Marcuvitz know something which cheated, blighted, condemned, and displaced Residents of MTP don’t know? Perhaps. This past Sunday we had the opportunity to spend a few hours at the Russell Military Museum. This privately owned museum sits just south of the border between Illinois and Wisconsin about an hours drive north from Chicago. The museum is situated right off the highway and is easy to get to. A somewhat battered looking M3 Stuart light tank marks the entrance to the museum parking lot, a former car dealership lot converted into a museum in 2007. This one acre parcel was part of a 6.99 total parcel and sold for the low, low price of only $64,830. The original 6.99 acres had a value of $236,400 for the land ($33,820 per acre) with an improvement assessed at $1,287,300 for a total of $1,523,700. MOUNT PLEASANT — Kim and Jim Mahoney say they have not heard from the Village of Mount Pleasant since it made its offer to buy their home back in April. They say they have not heard from the village since it voted on June 4 to blight the area they live on, and the clock might be ticking for the village. The Mahoneys live on a 1.8-acre parcel within Area I and have been negotiating with the village to sell, but things have gotten quiet. So they let the village send its own appraiser, Pitts Brothers and Associates, to value their land. According to the Mahoney’s, the village made a “lowball” offer to them based on the average of the two appraisals multiplied by 1.4 percent of the property value. Kim Mahoney declined to say what their appraisal number was, but said the village came in significantly under their initial appraisal. Residents also demand to be treated fairly with respect and dignity! They did it. They finally pulled the trigger on their own residents. A lawsuit has been filed in Racine County against the Village of Mt. Pleasant in response to a jurisdictional offer (the first step in the taking of property through eminent domain condemnation) filed on August 22nd against the first Mt. Pleasant property owner in the Foxconn area. We have requested a copy of the lawsuit and will post it as soon as we get it it. Please share this post.